The ZhongDe Group is headquartered in Frankfurt am Main, Germany. 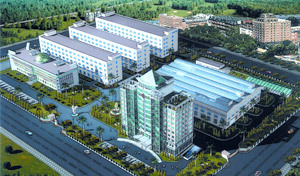 Most of ZhongDe Group operations are based in the Cangshan Technology and Science Park in Fuzhou (People's Republic of China), the operating headquarter is located in Beijing, China. On 31 December 2014 the ZhongDe Group employed 371 people. ZhongDe Group designs, invests, constructs, finances and operates energy-from-waste incineration plants generating electricity from the disposal of solid municipal and industrial waste. ZhongDe realises either EPC (Engineering, Procurement and Construction) or BOT (Build, Operate and Transfer) projects, focusing on large-scale plants with waste disposal capacities of around 1,000 tons per day. Since 1996, ZhongDe Group has installed approximately 200 waste disposal projects all within Mainland China. ZhongDe is one of the leading players in the project development and operation of energy-from-waste plants in China.